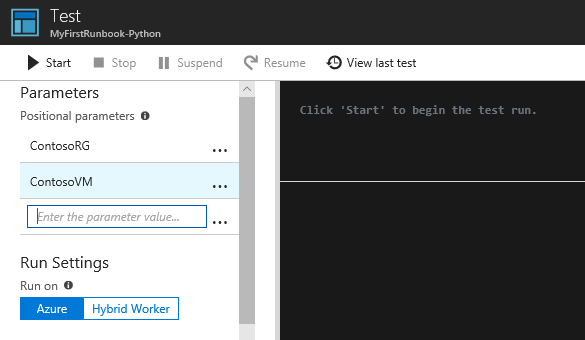 This tutorial walks you through the creation of a Python runbook in Azure Automation. You start with a simple runbook that you test and publish. Then you modify the runbook to actually manage Azure resources, in this case starting an Azure virtual machine. Lastly, you make the runbook more robust by adding runbook parameters. Using a webhook to start a Python runbook is not supported. You start by creating a simple runbook that outputs the text Hello World. Select + Add a runbook to create a new runbook. Give the runbook the name MyFirstRunbook-Python. In this case, you're going to create a Python runbook so select Python 2 for Runbook type. Click Create to create the runbook and open the textual editor. Click Save to save the runbook. Click Test pane to open the Test pane. A runbook job is created and its status displayed. The job status starts as Queued indicating that it is waiting for a runbook worker in the cloud to come available. It moves to Starting when a worker claims the job, and then Running when the runbook actually starts running. When the runbook job completes, its output is displayed. In this case, you should see Hello World. Close the Test pane to return to the canvas. The runbook that you created is still in draft mode. You need to publish it before you can run it in production. When you publish a runbook, you overwrite the existing published version with the Draft version. In this case, you don't have a published version yet because you just created the runbook. Click Publish to publish the runbook and then Yes when prompted. If you scroll left to view the runbook in the Runbooks pane now, it shows an Authoring Status of Published. Scroll back to the right to view the pane for MyFirstRunbook-Python. The options across the top allow us to start the runbook, view the runbook, or schedule it to start at some time in the future. You want to start the runbook, so click Start and then click Ok when the Start Runbook blade opens. A job pane is opened for the runbook job that you created. You can close this pane, but in this case you leave it open so you can watch the job's progress. The job status is shown in Job Summary and matches the statuses that you saw when you tested the runbook. Once the runbook status shows Completed, click Output. The Output pane is opened, and you can see your Hello World. Click All Logs to open the Streams pane for the runbook job. You should only see Hello World in the output stream, but this can show other streams for a runbook job such as Verbose and Error if the runbook writes to them. Close the Streams pane and the Job pane to return to the MyFirstRunbook-Python pane. Click Jobs to open the Jobs pane for this runbook. This lists all of the jobs created by this runbook. You should only see one job listed since you only ran the job once. You've tested and published your runbook, but so far it doesn't do anything useful. You want to have it manage Azure resources. To manage Azure resources, the script has to authenticate using the credentials from your Automation Account. To help you, you can use the Azure Automation utility package to make it easier to authenticate and interact with Azure resources. The Automation account must have been created with the service principal feature for there to be a Run As Certificate. If your automation account was not created with the service principal, you can authenticate by using the method described at Authenticate with the Azure Management Libraries for Python. Open the textual editor by clicking Edit on the MyFirstRunbook-Python pane. To work with Azure VMs, create an instance of the Azure Compute client for Python. # Initialize the compute management client with the RunAs credential and specify the subscription to work against. Where MyResourceGroup is the name of the resource group that contains the VM, and TestVM is the name of the VM you want to start. Test and run the runbook again to see that it starts the VM. The runbook currently uses hard-coded values for the names of the Resource Group and the VM. Now let's add code that gets these values from input parameters. This imports the sys module, and creates two variables to hold the Resource Group and VM names. Notice that the element of the argument list, sys.argv, is the name of the script, and is not input by the user. When you start a Python runbook (either on the Test page or as a published runbook), you can enter the values for parameters in the Start Runbook page under Parameters. After you start entering a value in the first box, a second will appear, and so on, so that you can enter as many parameter values as necessary. The values are available to the script as the sys.argv array as in the code you just added. Enter the name of your resource group as the value for the first parameter, and the name of the VM to start as the value of the second parameter. Click OK to start the runbook. The runbook runs and starts the VM that you specified.